← Parents of Would-be Child Actors: Beware of Scammers! Is Apple Changing its iTunes on Copyright, Resale? In December of last year, I published a blog post about the issue of digital asset ownership after the original owner dies. For years, Apple has insisted that the license to access content purchased on iTunes ends with the death of the original licensee — you don’t actually “buy” content, you simply license it. On Thursday of last week, the U.S. Patent Office released information on three separate patent applications from Apple that would allow customers to legally sell or loan used iTunes content to another person. The patent is titled “Managing access to digital content items” and is outlined in three separate filings from the company that date back to September 2011. Basically, Apple’s patent covers a method that would disable access to the files on the original device, and transfer access to the files to a new device, whether the content is stored locally (on a hard drive, iPad, iPod, or iPhone) or remotely (iCloud). The patent also covers temporary “loans”. It’s a turnaround for the company with a hidden silver lining for copyright holders: there’s a provision in the system that allows the original content publisher to receive part of the fee Apple plans to charge for transferring the license. The original rights holders (writers, musicians, publishers) are left out completely in the Amazon.com “resale market” for digital content (just as they always have in the used book/CD market). Still, it’s not clear if iTunes has the right to license the “resale” of digital content to a secondary license holder. I have seen some of the contracts app publishers and musicians have signed with iTunes, and it appears to grant iTunes the right to license the content just once, with no provision for “re-licensing”, since there was no such thing when the contracts were signed. So it may not be as simple as rolling out a new technology. But at least it’s a step in the right direction for customers and content creators. It will be interesting to see if the new technology will allow the sale of “pre-packaged” entertainment modules. For instance, an iPad that comes pre-loaded with games and entertainment titles appropriate for children, or an iPod loaded with the Billboard Top 100 or something. Several years ago, just as J.K. Rowling published the final Harry Potter book, one of the popular fan sites ran afoul of Apple by offering as a prize an iPod pre-loaded with audio books of all the Harry Potter books. The audio books had been provided by the publisher, and were fully licensed, and the site had purchased the iPod from Apple and pre-loaded them onto it. But Apple threatened to block the site’s podcasts from iTunes if it continued to advertise the “illegal and unlicensed” pre-loaded iPod, and the prize was withdrawn. The winner got a blank iPod and a code from the audio book publisher to download the books. So, while I’m personally quite happy that Apple appears to be moving toward allowing users to transfer the license to content purchased from iTunes, and even happier that their patent application includes a provision for payments to the original copyright holders, I think it’s too early to declare victory and stop fighting the archaic copyright laws that victimize creators and buyers alike. Right now, the only people who benefit from U.S. copyright laws seem to be the copyright trolls who sue and the lawyers who represent the defendants. 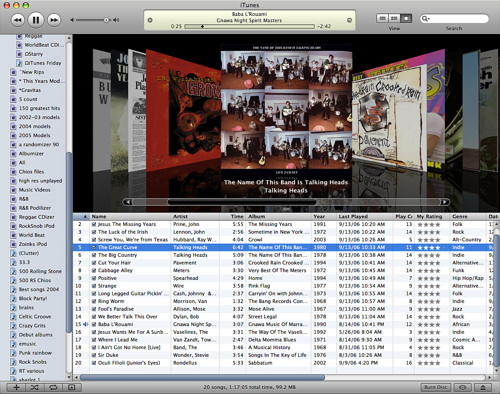 Photo Credit: Seth Andersen made this screen shot (of an older version of iTunes, v. 7.6) available under a Creative Commons license on Flickr. Gallery | This entry was posted in Law and tagged Apple changing its tune on copyright, Apple patent, Copyright, digital music, iTunes, law, legal. Bookmark the permalink. 1 Response to Is Apple Changing its iTunes on Copyright, Resale?